Limited to 900 Guitars! Designed with Peter Frampton and inspired by his legendary 1954 Les Paul. Featuring ProBucker™ and CeramicPRO™ open-coil humbuckers, Ebony fretboard, and gold Grover® Rotomatic machine heads. Epiphone presents the new Ltd. Ed. 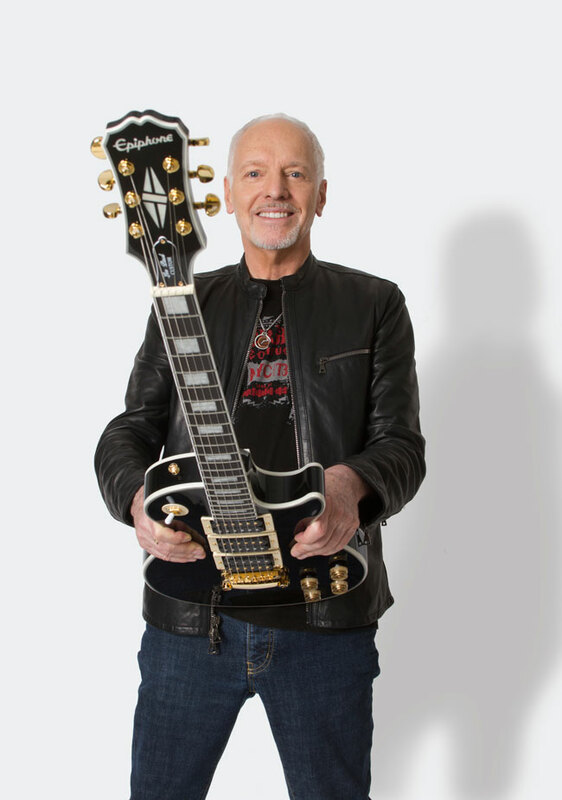 Peter Frampton Les Paul Custom PRO, an incredible recreation of one of the most legendary guitars in rock ‘n’ roll, overseen by GRAMMYTM winner and Musicians Hall of Fame member Peter Frampton and designed by Epiphone’s luthiers in Nashville, TN. Featuring a classic Les Paul with a weight-relieved Mahogany Body and Hard Maple Cap, Epiphone® ProBucker™ and CeramicPRO™ Open-Coil Humbuckers, Grover® Rotomatic machine heads, and an Ebony fretboard. Available for a limited time only at select Authorized Epiphone dealers and limited to 900 guitars. From that moment on, Frampton’s Les Paul was his go-to instrument on stage and in the studio until 1980, when the guitar was thought to have been destroyed in a plane crash in Caracas, Venezuela carrying instruments and other tour cargo. But in 2011 in a surprise and emotional reunion, Frampton’s long lost Les Paul was returned to him by Donald Valentina, a Curacao customs agent and amateur guitar player, who discovered that the instrument had survived the crash and arranged for it to be returned to Frampton. Gibson’s world famous repair shop in Nashville painstakingly repaired Frampton’s Les Paul –which he nicknamed “The Phenix,” and returned it to him, scars and all. Now Epiphone’s luthiers, with the help of Frampton, have recreated his trademark Les Paul as it looked when it was given to him at the Fillmore West in 1970! Headstock Traditional Epiphone w/"Peter Frampton" signature replica on back in GOLD. The Ltd. Ed. Peter Frampton Les Paul Custom PRO features a 50s Les Paul profile with a Hard Maple Cap and a weight relieved Mahogany body with a beautiful Ebony gloss finish. The Mahogany neck has single-ply white binding and a Custom “Phenix” profile designed with Frampton and is glued to the body with a traditional Long Neck Tenon. The Ebony fretboard has Pearloid "Block" inlays, a 24.75” scale, 22 medium jumbo frets, and a 12” radius. The two-way adjustable truss rod has a classic “bell” cover and the traditional Epiphone headstock has a replica of Peter Frampton’s signature in gold on the back. The body has traditional Les Paul Custom style 7-ply White and Black binding on the body top and 5-ply white and black binding on the body back and headstock along with a "2018" Edition logo. Frampton’s original Les Paul was customized with three open-coil humbuckers and his new Ltd. Ed. Les Paul Custom PRO recreates the look and sound of Frampton’s vintage original with Epiphone ProBuckerTM pickups in the neck and bridge positions and a CeramicPRO™ pickup in the middle position. The critically acclaimed ProBucker series accurately recreates Epiphone and Gibson’s most famous pickups with historically accurate wire, winding techniques, bobbins--and most importantly--Alnico and Ceramic magnets. The Epiphone® All-metal 3-way Pickup Selector has a unique wiring scheme that selects between the neck or bridge pickups only, just like a regular Les Paul. The middle pickup is always “on” but has its own volume control so it can be blended or turned off. The lead and rhythm pickups each have a master volume and tone control while the middle pickup has its own volume and tone pot. 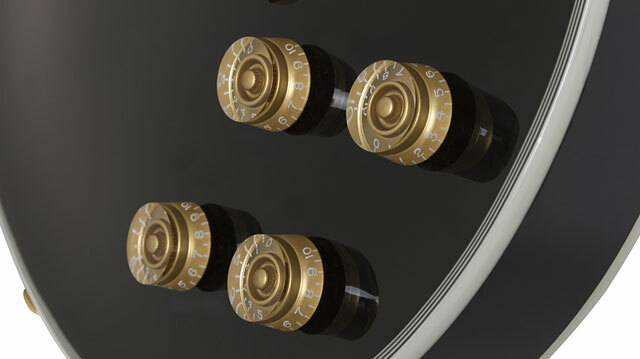 All volume and tone controls feature historically accurate Gold "Speed" Knobs. Epiphone hardware is the best in the business and the Ltd. Ed. Peter Frampton Les Paul Custom PRO features a gold LockTone™ Tune-o-matic bridge and Stopbar tailpiece for fast and accurate intonation along with gold Grover® Rotomatic™ machine heads with an 18:1 tuning ratio and Epiphone strap locks. An unsigned Certificate of Authenticity is included and a standard Epiphone Les Paul hard case is also available. Like all Epiphones, the Ltd. Ed. 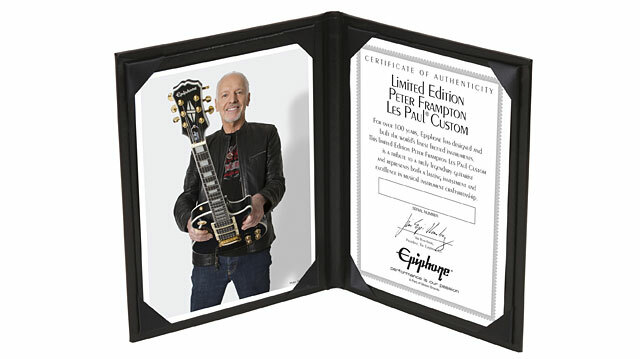 Peter Frampton Les Paul Custom PRO comes with a Limited Lifetime Warranty and Gibson’s world famous 365/24/7 Customer Service. 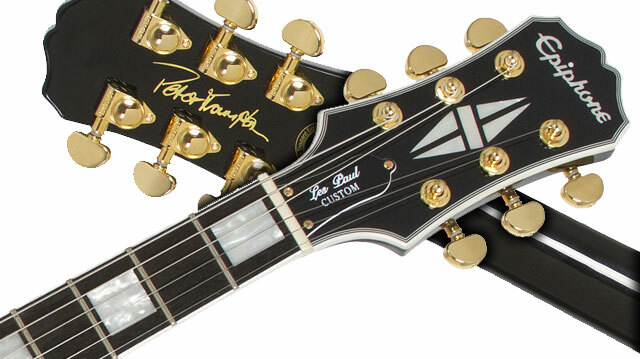 The Peter Frampton Les Paul Custom PRO is limited to just 900 guitars. Visit your Authorized Epiphone Dealer today while supplies last!